Yet another function where my attendance is somehow mandatory, seated at a round table with barely room for five couples none of whom I know; if I did get to know them I am confident I would not like their company. Men in suits that look like they originally belonged to their fathers with dress shirts that are so small that the top button can only dream of ever being reunited with its intended closure. A failed attempt to hide up the fact that the shirt is far too small made by disguising the open space with the large King Edward’s knot reminding one of a convicted felon, neck in the noose, awaiting the final drop to oblivion. Then there is the inane conversation. The ladies content to swap stories of grandchildren and the men struggling to find a mutually respected sports team. My wife has cautioned me on several occasions about my conduct and what I should and should not say or discuss among those of whom I am unfamiliar. To the question as to whether I follow or have an interest in a certain sports team I now simply say “no”. Apparently this is preferable, according to my spouse, to replying with, “not in the least”, to the sports question. Personally I can tolerate those with single faceted, career related, interests at least they can be interesting and there is a slight chance that one can actually learn something new, making the sacrifice of my time, a finite commodity, somewhat worth the expenditure. I like to hope that at least a couple of these posturing male gorillas attempting to establish themselves to be the alpha silver back has enough intellect to avoid metaphorically throwing their own feces and even accidently offering up a topic of interest; but sadly, no. It’s not that there are no topics that I could be engaged in to discuss, even debate. Of course history, but also science and the feared taboo topics of politics and religion, both of which I am quite capable of carrying on a civilized, or a more heated, conversation. Finally there is an oasis in the midst of this sea of banality, the “seven minute lull”. It has been said that during any conversation, I suspect even more so during trivial banter, there will be a lull in the conversation every seven minutes or so. It is times like these that I find myself wishing there was a terrorist waiting in the lobby ready to rush in, encased with explosives, screaming some ridiculous babble, intent on ending our existence. Oh, would it were so. I assure you that I would run up to this fanatic, hugging him, pulling the detonator pin myself; but, again, sadly no. Just prior to the so-called lull and my wish for escape, any escape, someone said, “The problem with today’s society is social media”. Eureka, the topic for this month’s blog suddenly came to me. No, no, not today’s social media as my “world” is the mid to late 19th century; it is the media of the Victorian times and in particular the “fake news” (yes, I know the modern reference) as it pertained to the British military swords and bayonets of the day. Oh, yes, the topic of what is wrong with the world today quickly deteriorated into what was wrong with today’s youth. From what I see today’s youth is basically not a lot different from the youth “of my day”. I just may not have yet reached the age where I am convinced that I know what the problems of today are and especially how to solve them. Though I suppose some people are wise beyond their age; yep, sarcasm. We are all exposed to today’s media, be it through the handheld devices, laptop, PC, or traditional media. It is apparent that some sources are very bias toward a certain political idealism or popular consensus but while we may think we “own” this phenomenon as it seems so relevant to our times it is nothing new. Reports back to the home front from military actions, for example, have been common place for centuries in the form of official war diaries and more “as it happened” journalism through war correspondents. In the mid to late nineteenth century war correspondents were often “in the thick of it” during battles such as the Zulu and Sudan campaigns. In the case of the Sudan campaign, the Battle of Abu Klea 16 January 1885, some of the war correspondents defended themselves during this vicious battle with their privately purchased revolvers. As a point of possible interest an ancestor of mine, Lieutenant Richard Wolfe, No. 4 Co., HCR/Scots Greys, lost his life defending the British square during this battle. As I have stated above some of the news papers of the time were very quick to point fingers, as to blame military failures, on the political party in power, in particular the Prime Minister. It was found that some of the swords and bayonets failed to perform as needed during the fierce battles often resulting in the death of the British Officer or soldier. This resulted in what was called the 1885 Bayonet Scandal. Basic blame was placed on the poor quality of the swords and bayonets used by the troops. In the case of the Officers they purchased their own swords as opposed to the NCO and other ranks who were issued government supplied weapons. At the time many sword blades were made in Germany and then sold to sword makers in Britain who would then finish the sword and sell it to the government for issue to the NCOs and other ranks, then swords for the Officer class were sold to retailers for private purchase. Some of the tailors, or retailers, would even place “proof marks” on the ricasso as if the sword had passed testing and were therefore “battle ready” which many were not. The “scandal” resulted in the testing of swords and bayonets already in the hands of the military as well as those in stores. It was found that a large percentage of weapons failed the trials; in the case of the socket and sword bayonets for the Martini-Henry this involved both the bending and twisting tests. 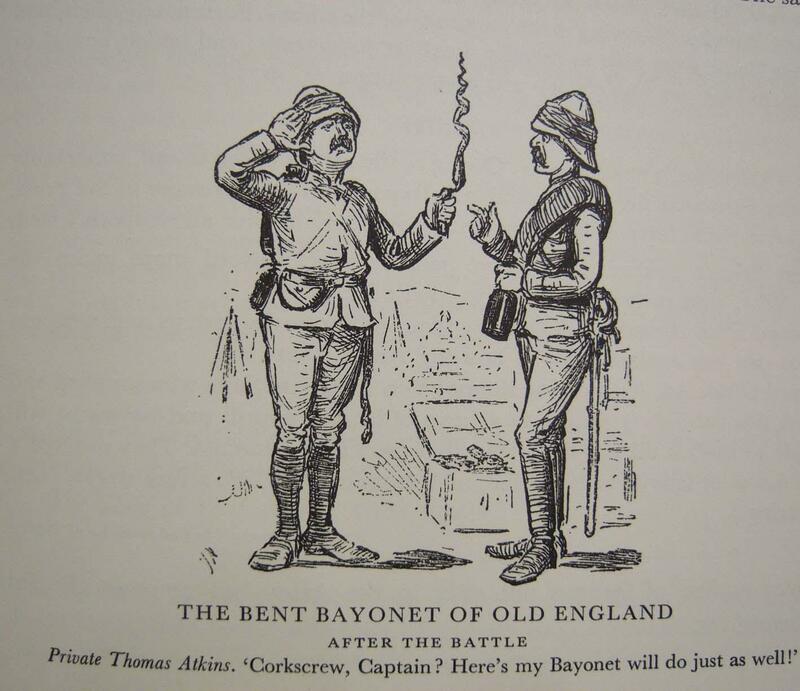 One of the early excuses for the failure of bayonets in the field was the accusation that soldiers used their bayonets as pokers to keep camp fires blazing. This was a “smoke screen” used by authorities to hide the testing results and associated blame from the public. An article in The Times, 13, January 1885 discounts this quoting an army source as saying, “Any use of a bayonet as a poker would not likely pass inspection the following morning”. This served to discount the original accusation. While the contractors who produced the sub-standard bayonets were never officially named there were two factors uncovered by the investigation in the manufacturing process that caused the defects. Source: “British Military Bayonets from 1700 to 1945” by R.J. Wilkinson Latham. The Patterns involved in the scandal, the Pattern 1853 sword-bayonet and the Pattern 1876 socket bayonet, were replaced by the Pattern 1886 which brought to an end the problems experienced. Future sword and bayonet manufacture was dominated by the firms of Wilkinson and Mole and manufacturing of weapons from firms in Germany ceased. In this blog we looked mainly at the British bayonet and the associated scandal, in next month’s submission (Part 2: Staying Sharp) we will discuss the earlier problems with the British Cavalry swords, in particular those used during the Indian Rebellion of 1857 (also known as the Sepoy Mutiny). Previous entry I Hate Moving! You need to garner invitations to some better dinner parties! Great to read you again! Hope all is well. Thanks for your comment, all well here, though perhaps I need to find my own friends rather than always going to my wife's friend's functions.